Two men have appeared in court charged in connection with the alleged killing of Blackpool teenager Charlene Downes. Iyad Albattikhi, 28, appeared before Blackpool Magistrates' Court charged with murdering the 14-year-old on or about 1 November 2003. Mohammed Raveshi, 49, was charged with assisting in the disposal of her body, which has never been found. Both men, from Blackpool, were remanded into custody to appear back in court at a later date. Mr Albattikhi, of Dickson Road, and Mr Raveshi, of Hornby Road, spoke only to confirm their details and that they understood the charges during the hearing on Thursday. Magistrates sent the case of Mr Albattikhi to Preston Crown Court, where he is due to appear on 15 June. Mr Raveshi is due to appear back before Blackpool Magistrates' Court on 13 March. 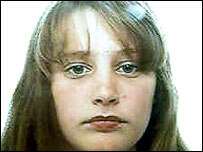 Charlene Downes has not been seen since 1 November 2003 when she said she was going to a bar with friends.